KFAR JOZ, South Lebanon , Sep 11 2011 (IPS) - Even in the summer heat, the hills of South Lebanon are an impressive sight – a patchwork of green, brown and red fields interrupted only by sleepy villages, rock formations and dirt tracks. “Our vision is a Lebanon free from cluster bombs, land mines and explosive remnants of war,” Bou Maroun tells IPS. 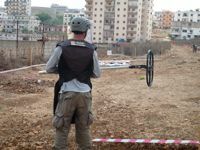 With sufficient funding and support, he says Lebanon could be cleared of cluster munitions by 2016. Following international pressure, Israel provided the Lebanese Armed Forces (LAF) with maps showing the areas it targeted with cluster munitions. But, says Bou Maroun, as these maps do not show the coordinates of those targets, they are merely “papers for the trash”. And for many, any international ban will come too late. “I wish I could change my leg and get a new one,” says 12-year-old Mohammad Abd al-Aal, who has been left with a prosthetic leg after stepping on a cluster bomblet while herding his family’s goats.